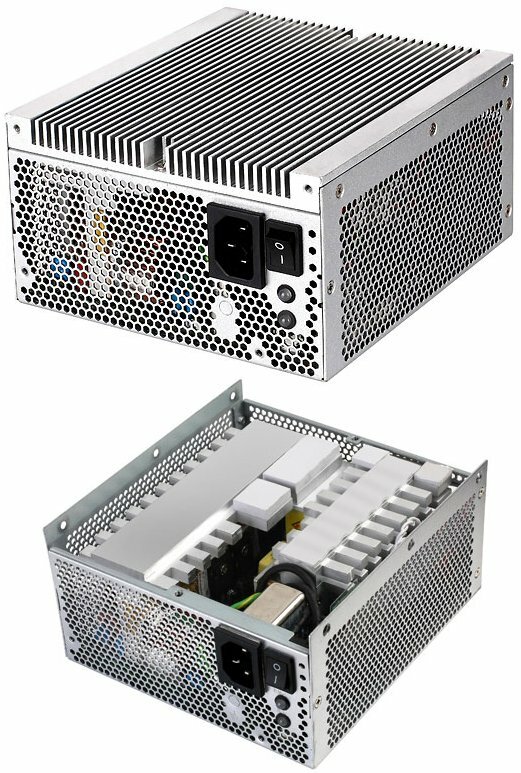 SilverStone will soon ship the Nightjar ST50NF, a new 500W passively cooled power supply with a MSRP of 129EUR. This unit has 80Plus Bronze certification (88 percent efficiency) and uses a single +12V rail with a maximum of 38A. All cables are fixed and the unit has an aluminium heatsink-like enclosure to dissipate the heat. The fanless Nightjar series power supplies are long favorites for professionals and enthusiasts alike that require noiseless power solution with no moving parts. With increasing power demands required from modern computers, SilverStone engineers have once again created another fanless power supply with leading output level in the ST50NF. With 500W of continuous rating, near 80 PLUS Silver efficiency, ±3% voltage regulation, single +12V rail, multiple PCI-E connectors, and full host of safety features, the ST50NF is a great choice for mission-critical systems that need to operate in noiseless or dusty environments.